This is a horrible thing for a bird, let alone a mouse. It is a slow death, if the mouse doesn’t chew off its poor little paws in order to escape. Not all birds are found like this one was. Let’s do our best to boycott these glue traps, and if you can all send a letter to the editors of your respective newspapers to reach other people, I would be very grateful. Thanks, everyone. Nandina is beautiful, but it will kill birds, as well as other animals. Either get rid of it, or prune the berries off the bushes. 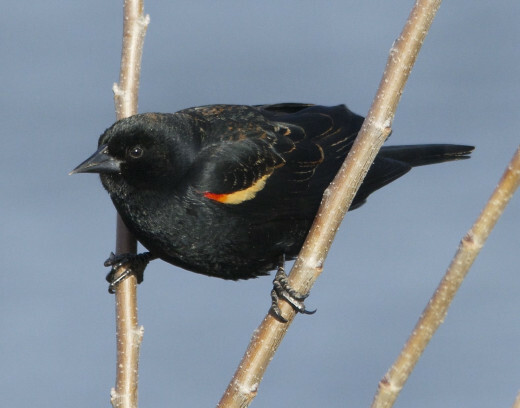 Feeding wild birds in winter is a kind deed many homeowners take quite seriously. But be sure you aren't accidentally providing a poisonous side-dish lurking in the landscape! 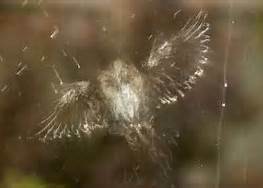 A large number of birds hit windows and die a startling number of times each day. ABC tape provides a great solution, as do suncatchers, CDs and a host of other things. If you’re having a problem with this, or know someone that is, please give them of these suggestions. It really works. Here is what you all have been waiting for, a movie about birders. People just like us, but to make it even more delightful, these are young people—like me. Let’s go get ‘em and prove that extinct species still exists! I know that it has been an extended and rough winter for most of the country. Yes, the groundhog lied, but let’s face it folks, he was under duress. He wanted spring just as much as we do, so he was trying to buy a little extra time, but please, let’s not kill the messenger. He would have delivered if he could have done so. However, good things have been happening here, and we are gearing up. It is officially spring. 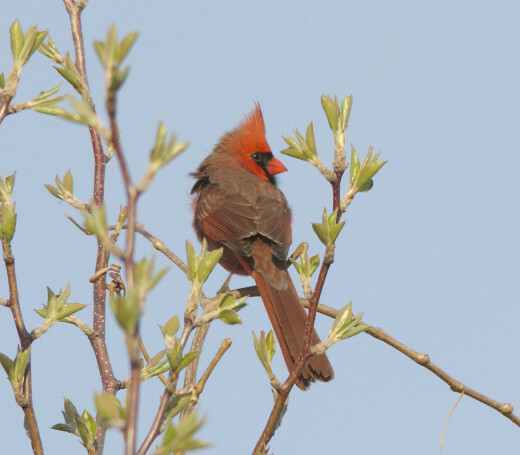 Trees are budding and flowering, and some of our spring birds are already here. 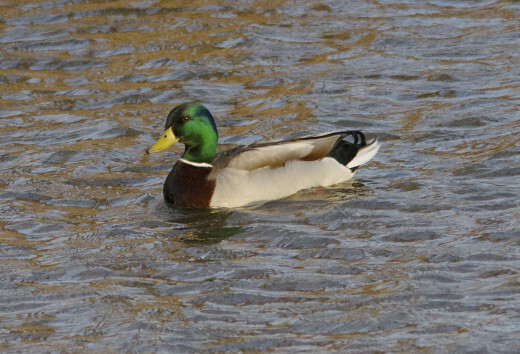 Mallards and Canada Geese are coming to the area for breeding purposes. If you recall my column last year, we had a fine crop of youngsters, and this year we will still have a good, strong batch of goslings and ducklings. Animals that can brave harsh winters generally beget a tougher group of young ones that can make it through nearly anything. We’ll unquestionably be looking forward to that, too. 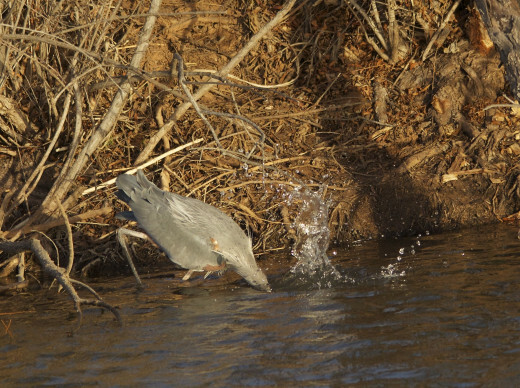 There have been a couple of Great Blue Herons that spent the entire winter with us, bless their little hearts. They had hardships, but they survived them all by themselves. When the lake was frozen, they ate mice and anything else that they could get their bills around. Granted, they got a little thin, and I would have intervened had it been necessary, but I didn’t. They all came through with flying colors. Oklahoma birds can handle the cold as well as the heat, and I consider them all exemplary creatures for what nature has to offer. 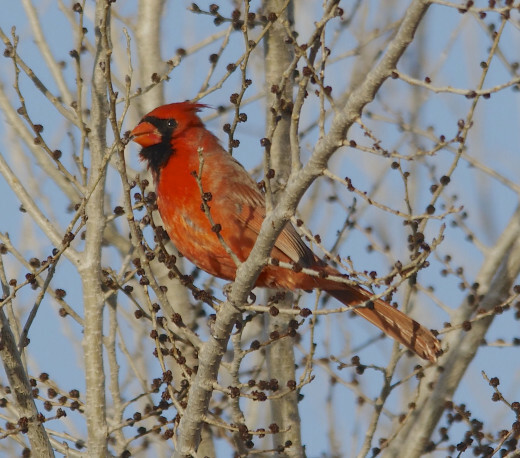 There are more Northern Cardinals than usual that spent the winter with us. Not only did they cheer me on during those icy cold days with wind chills at zero and 25-30 mph winds, but they cheered on other winter birds, and even got the Blue Jays out by the lake. Even though they spent very little time with us, they were still in motion. Let’s hear it for our beautiful and gracious cardinals! 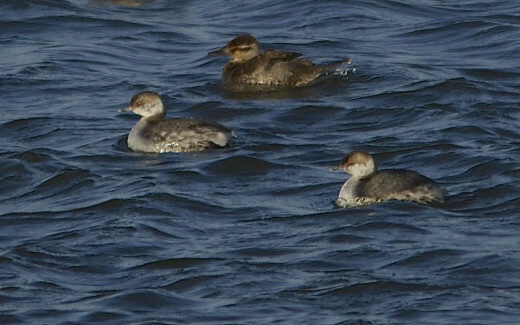 We were even visited by the Horned Grebes this winter, as well as the more common Pied-billed Grebes. The Horned Grebes actually spent a few days on Boomer Lake and got plenty to eat here in Stillwater. 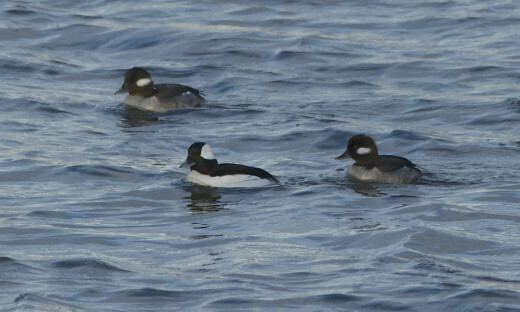 The Buffleheads are still with us, and it is always wishful thinking, but I’d certainly love to tell you that we have youngsters, too. Maybe one of these days we will. 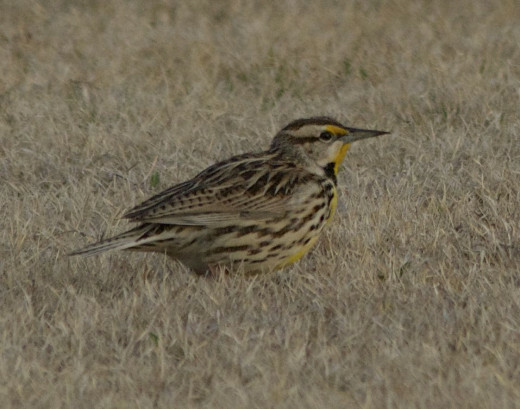 The Eastern Meadowlark was here all by his lonesome, too, hanging with the American Robins, who have really come in full force. 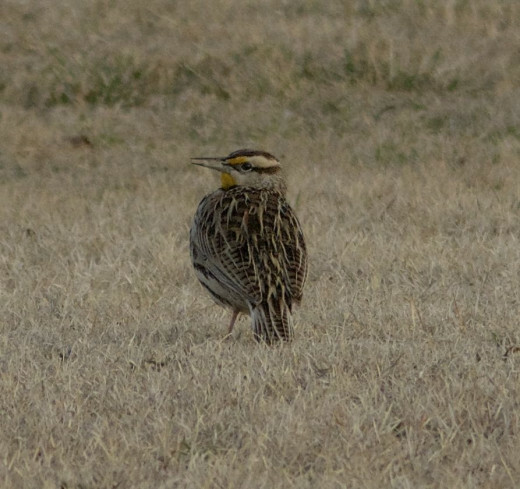 This is the largest crop that I have seen, and when I heard that meadowlark singing in the midst of that group, I readily found him. He gave me several good clicks, and it made that cold morning well worth it for me. 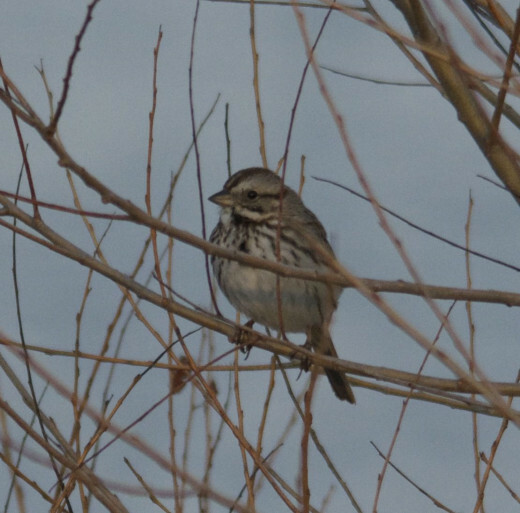 The Song Sparrow has been out steadily for the past few weeks, too. Even though this little guy has been somewhat shy and retiring, I still managed to get a good shot of him. He has been eating weed seeds and has ben a very bright spot here for me. 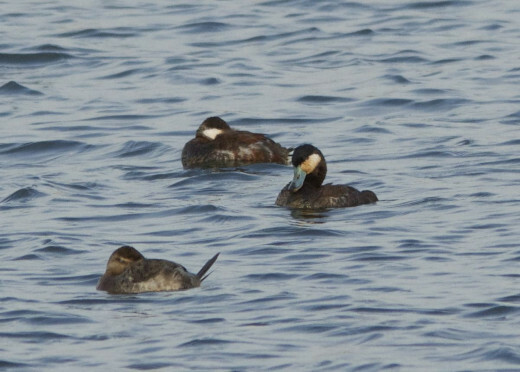 Some of the male Ruddy Ducks are getting their breeding plumage, and that classic blue bill. I spied one of them today, and he was more than happy to provide a photographic opportunity. Well, to be honest, this one loves to be noticed. To top off an utterly perfect Wednesday, this Bald Eagle was looking for breakfast and happened to be right in my vicinity. At first, I didn’t see it, but a Canada Goose pair told me all about his arrival. Sadly, my quick shot of the Red-shouldered Hawk didn’t pan out, but it will happen. This one has been around for a good two weeks now. It’s nice to see my kith and kin coming home for the season. Keep your eyes to the ground and your head in the clouds. Happy birding, and I hope to see you at Boomer Lake. Ciao until next time! Yasuhiro, sometimes you never know what the resemblance is that some people see. I think it is just the eyes that are similar...but rllaey, not even a resemblance. I had someone in a restaurant tell me I look like Jennifer Anniston. Honestly? Are you blind? Some people are just CRAZY! I love all you photos, but was so thrilled with the bald eagle's. It would make my heart soar to see one in flight like his. Thank you. Thanks, Peg. I was trying every way that I could to show people all the awful hazards out there that our wildlife have to contend with every day. Ditto on Billybuc's comment, Deb. 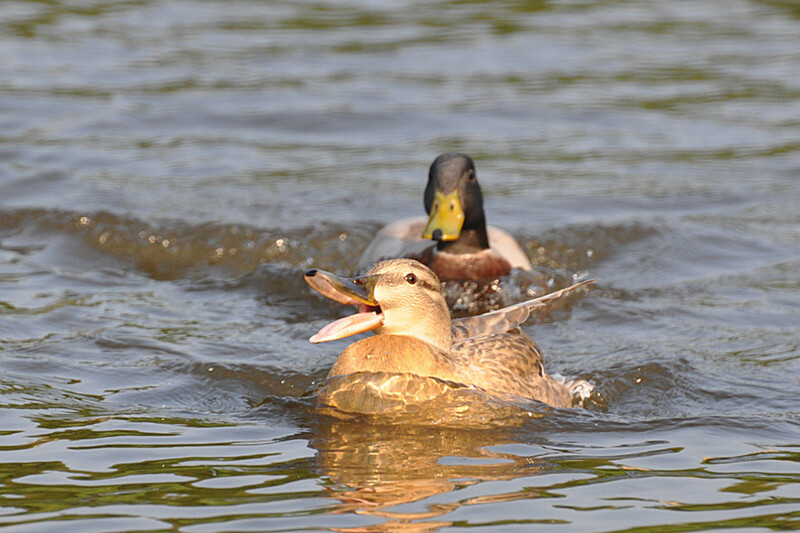 You provide useful resources and additional information on birding along with your prize photos and key points. 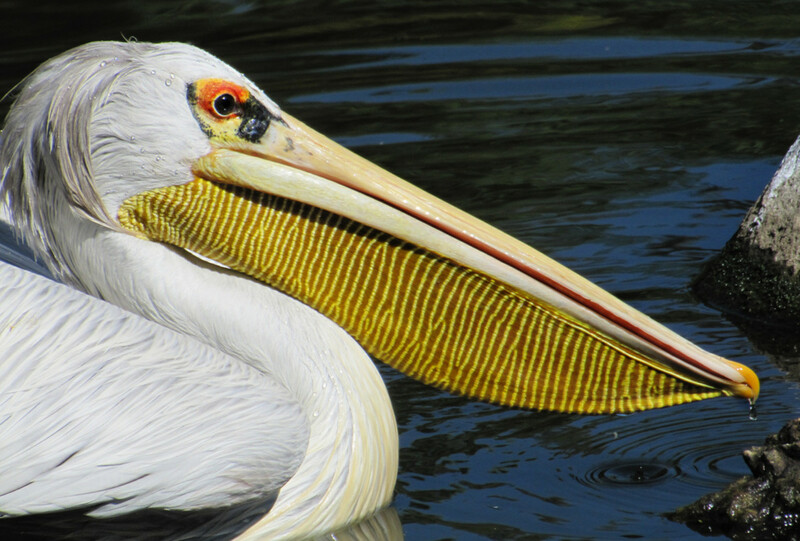 Thanks for your efforts to keep birds safe from offending traps to control unwanted pests. That is a horrible way to die. So very sad and sobering to realize. Thanks, Mel! Poor little sparrow probably tried to take refuge in the dryer vent, and someone turned the dryer on and burned him. No, the north is not safe yet, that's for sure. Luck for me, I don't reside in the northeast any more. I had enough of those winters. Your pictures get better all the time. I saw a dead White Crown Sparrow beneath a laundry room window at an apartment complex a few weeks ago. He was a very beautiful bird and his plumage was in perfect condition, which is how I knew he was not killed by a predator. They travel here all the way from the Canadian tundra every year and this is how they end up. By the way, the White Crowns are still here, singing away, which makes me think it's not safe for them to go back to their nesting grounds up north yet. Not a good sign for you winter weary folks east of the Rockies. Excellent hub. Good to see you, precy anza. Thanks so much for visiting and enjoying the photos. Field notes is my way of trying to educate people on both good and bad things. Dropping by to visit the lake with you Avian :) Beautiful photos, but feels sorry for the bird on the first photo. The last photo is my favorite, love the shadow and the splash of water. Up and shared! Dave, that is such an exciting piece of news about the White Storks. Thanks so much for keeping me informed. Another wonderful visit and as always enhanced by you photographs. The informative advise you give ,ie, glue and berries etc, is important and I hope it will be taken in. A bit of news for you from over here White storks have bred for the first time in 600 years. Voted up,interesting and useful. Thanks, Bill. Yes, I do believe that we are finally on our way! Hi Deb. That first photo is heartbreaking. The rest are wonderful. Spring has been slow to arrive here this year, hopefully the next few weeks will warm up. Great job. Thanks so much, Alicia. I am so glad that you are interested in what nature has to offer. Spring is an exciting time for bird lovers! I'm enjoying all the new observations that I'm making where I live, and I love to read about your observations at Boomer Lake. Your photos are a lovely bonus! Hey, Glimmer Twin! That's why I put that photo as the lead pic, so that people are able to see what happens with those traps. So many people just DON'T know. Thanks for reading, and please let people know about these things. I do appreciate you. Glue traps are the worst and that photo breaks my heart. We have a big problem with birds hitting our windows, especially in the winter. It's the way the sun hits them and they usually get stunned, but every once in a while one will die. We do put different things on the windows to try and deter it. Luckily it was so overcast this winter that we didn't have as many problems. Thanks for the news, tirelesstraveler! 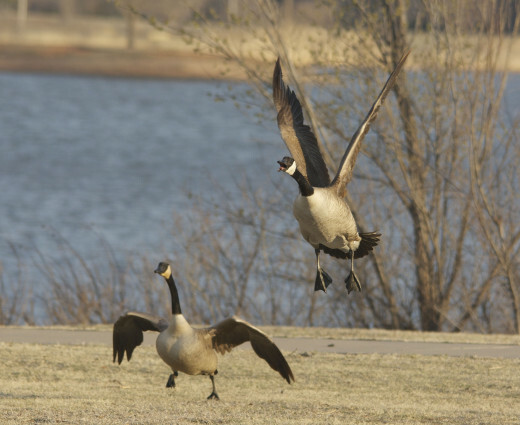 There are a pair of geese that started landing at our park. They have discovered my dogs won't bother them. This morning another pair landed, saw the dogs chase the ball toward them and flew away. The other pair were chuckling knowing they were safe with my dogs. To my knowledge, they only eat live food, Suhail. I have never known them to eat anything dead. My favorite series that gets me going for the outdoors. Great information and lovely pictures. 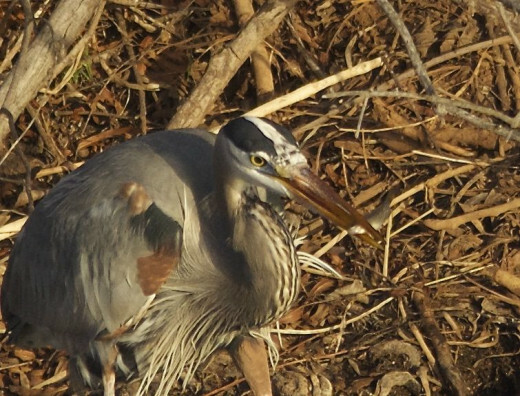 How would have to fed Great Blue Herons may I ask? :-) Leaving dead frogs, fish, mice there? I am just guessing. Thank you so much Deb for another visit to the awesome Boomer Lake. All your hubs are so interesting and well presented; you are such a natural writer and I often feel I am at your side. Voting up, sharing and wishing you a wonderful day. Lots of love from Wales. Thanks, Jeannie. Hope that all is well. Faith Reaper, restaurants use them and birds have been known to get caught there. We used to get them at Tri-State Bird Rescue like that. Thanks for the shares, as people will learn how to protect our wildlife. Oh, dear, that is horrible for that sweet little bird there! I did not know people used those glue traps outside, but just inside for rodents. It is a slow death for sure. 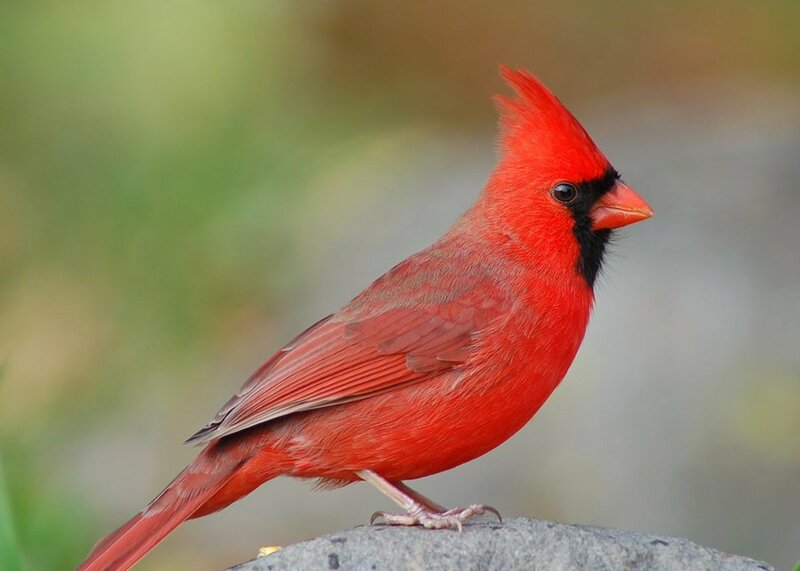 That Northern Cardinal photo is stunning!!! Thanks, Nell. It is one of my jobs to help educate people with some of these awful things out there that can hurt our birds and animals. I kep saying to tell the kids and they will pass it on the everyone. They're more in tune than many adults. Cris--I knew that you'd like the red-wing. They really are gorgeous birds. When you go to South America, check to see if you can get some of that bird friendly coffee that is grown in the jungle. That is supposed to be the way that coffee should be grown, not in open fields. Check out that movie, if you can. I'm going to try to see if I can get it…I can always view it on this computer. As always, your hub is an enjoyable breath of fresh air and new life! Glue traps are known to be used in restaurants. Birds have flown in the back doors of the restaurants and have been captured as a result. 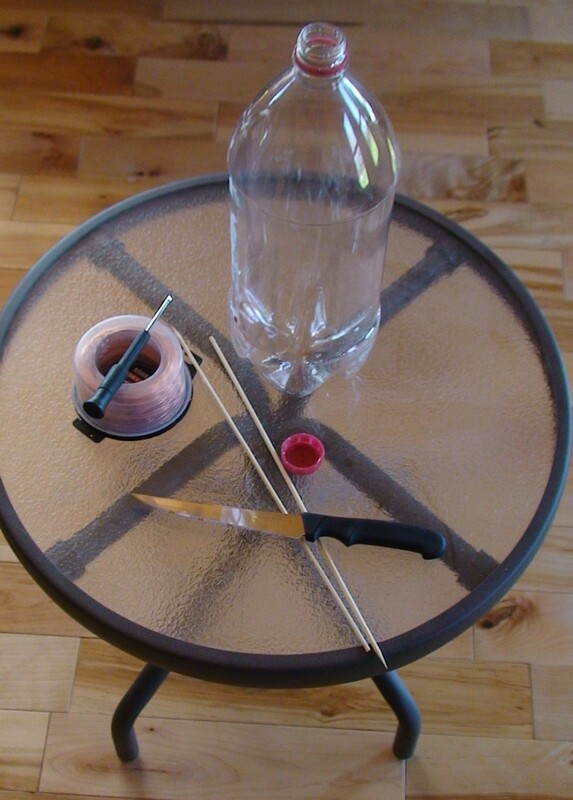 Also, If you get a couple of mice in there and they struggle, the trap can literally, "walk' out the door. Nandina is a popular bamboo derivative that was originally Asian. Many bamboos can be invasive if the temperature is right. Glad that you liked those two pictures in particular, and I appreciate the shares for purposed of education. Thanks for caring, Kevin, it means a lot. I would say great work Deb but I am sure that you know that. I have heard of glue traps but I thought that people used them indoors. I guess that they are no good if the mice get away. I would rule them illegal if they kill other animals! 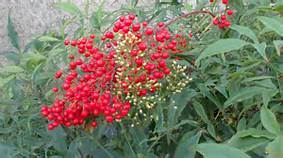 Do you have to plant nandina domestica or does it grow on its own? I do not own this yard so I have not looked at it. 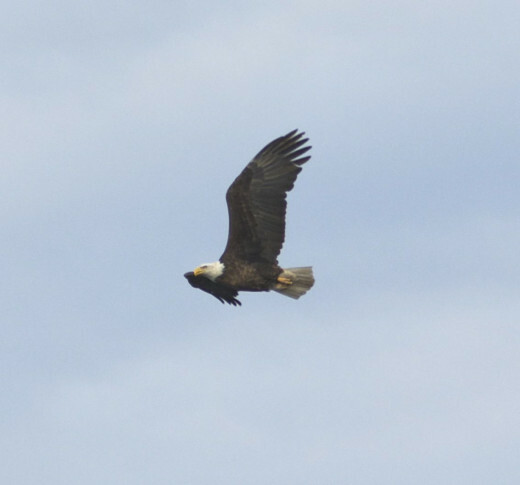 My 1st favorite photo was the Red-winged Blackbird, my 2nd was the Bald Eagle. I voted this up, straight across plus shared it. No, Jackie, with technology, simplicity vanished. We need to try to get back to basics again. Yes, poison tends to make poisoned animals crave water and go outside looking, which is why they are found by birds. The birds, in turn, are poisoned, too. 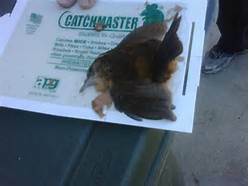 You would not have liked the picture, as it showed a bird in a glue trap. That's why I used the picture, to show that horror. The first picture is not opening for me but love the rest. This does seem like a heartless trap although I have no pity for rodents that can carry disease I do think they deserve a quick death but I guess if you think about it a poisoned rat or mouse might be eaten by a bird and kill them. Kind of hard to set traps for all that we need rid of...I don't have the answer. Nothing is simple anymore is it? Thanks, Billy. I'm so glad that you like the column. I have certainly been enjoying the Chicken Chronicles and all offshots thereof! This is one of my favorite series on HP and for good reason. It is well-written, informative, and provides some outstanding pictures. Excellent work as always, Deb.